INOX (also known as stainless steel) sensors are ideal for heavy duty food and beverage applications, but with so many types available which is right for your application. This article from Sick explains all you need to know. 1. Chemical Resistance: Can the sensor withstand the chemical environment? The Standard test is a basic requirement with regard to chemical resistance. A broad spectrum of chemicals with various combinations of “concentration – temperature – application time” are tested. Ecolab tests long-term resistance to conventional detergents and disinfectants produced by ECOLAB. The test simulates the exposure scenarios that are typical of this sector by storing the test specimens in the various media for a period of 28 days. The Wash-down /Hygiene test simulates the conditions typical of applications in the food and beverage industry. The sensors will be tested on different site specific detergent at various combination of “concentration – temperature – application time”. The Long-life test combines all relevant tightness requirements plus requirements with regard to chemical resistance. The test specimens are repeatedly put though a cycle of progressively more demanding tightness tests and chemical resistance tests. Among other things, these tests simulate the requirements of a typical Wash-down, i.e., the daily cleaning process used to ensure that a working environment is hygienic. 2. Thermal resistance: can the device withstand temperature swings? The Storage temperature test proves that the device can withstand the maximum temperature stated in the data sheet. The device is not wired. The Climate test verifies that condensation cannot form on the inside of the sensor’s front screen. The defined test limits of 25°C – 55°C (at 95%) simulate the climatic conditions typical of practical applications in the food and beverage industry. 3. Tightness: Can the sensor block bodies/fluids from getting inside? The Vacuum test verifies the tightness of the devices by holding them under water (20°C) for one minute. Different applications require different test pressures. 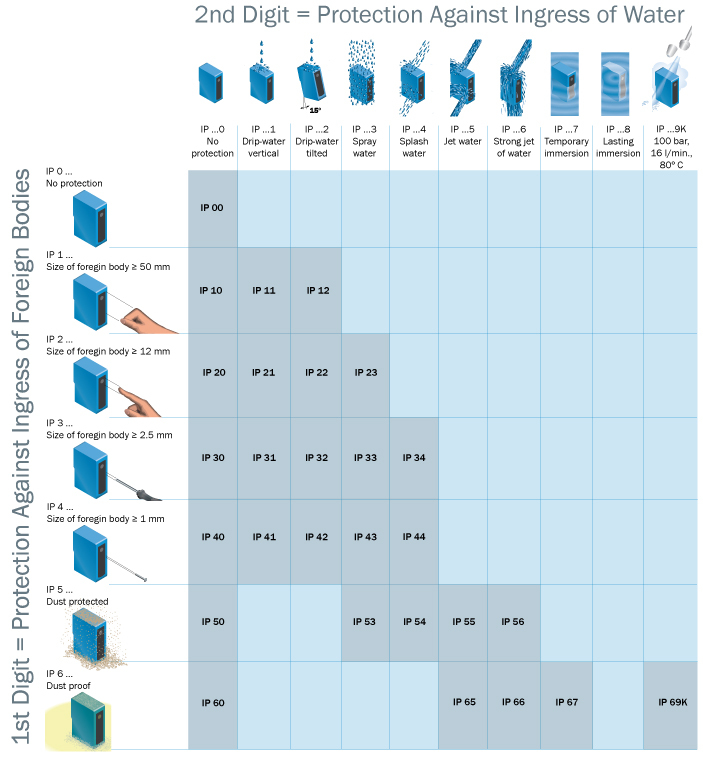 IP Enclosure ratings determine how well the device is protected against penetrating foreign bodies (the 1st digit) and secondly, how well the device protects against water ingress (the 2nd digit). ii. IP68 verifies whether the device is protected against dust, and water ingress for an unspecified time during immersion. There are no concrete test limits in this case, only the requirement that the test conditions should be stricter than for IP 67.
iii. IP69k verifies that the device is protected against dust and against water penetration from any direction even when the pressure to which the housing is exposed increases dramatically. This test is carried out at a temperature of 80°C and a pressure of 80-100 bars. The more intense tightness test also verifies the mechanical resistance of the device. iv. The Water shock test verifies the tightness and reliability of sensors under violently fluctuating water temperatures. First, the device is immersed in a bath of water at 10°C, where it remains for 3 minutes. Then the device is moved and immersed in a bath of water at 70°C. This cycle is repeated 500 times. 4. Design and materials: the design of the device and the construction materials must be smooth enough that bacteria will not stick, but not so smooth that the detergents run off too quickly. The Basic Design requires that the device as well as any mounting or connection that comes in contact with the medium in question is designed in a specific way. There are guidelines that provide those details. There are also stricter Hygienic Design standards that dictate that the device cannot have any crevices that will trap food (such as EHEDG in Europe). They must be followed or the device cannot be sold in that application. Materials used for contact with food and pharmaceuticals must be suitable. For example, stainless steel 1.4404 (316L) is acceptable as base housing material in Europe and for the dairy industry in the US. 5. Market standards: are the local device requirements that must be met when a device is installed a specific installation/application. An EHEDG (European Hygienic Engineering & Design Group) certificate is issued when the device has been tested and passed the European EHEDG requirements. 3-A certificates are issued in the USA for devices to be installed that have met the 3-A Sanitary Standards (mostly for the dairy industry). FDA approval is needed in the US for devices installed in food and drug applications, as well as medical devices and more. Ecolab and Johnson Diversey test (and certify) that the device is compatible with their detergents and chemicals. 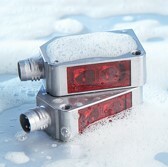 SICK offers a wide range of INOX sensors for presence detection applications. If you would like more information about Sick Stainless Steel Sensors or would like some advice to choose a Sick sensor for your specific application, please call 01254 685900 and speak to a Technical Support Engineer or your local FIeld Sales Engineer, they will be happy to help.